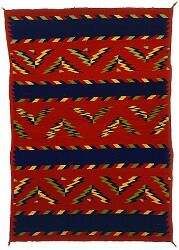 Blanket, Navajo. Purchased from Ganado Mucho by Matilda Coxe Stevenson, probably near Ganado, Arizona, in 1881. Department of Anthropology, National Museum of Natural History, Smithsonian Institution. cat. no. E220190, acc. no. 41372. Dimensions: 74.5 in. (warp) x 52 in. (weft). Technique: Plain tapestry weave with lazy lines. Thread count: Warp = 8-9/in. ; Weft = averages 26/in. Fibers: Warp = 1-ply handspun wool yarn, natural white, Z-spin. Weft = 1-ply handspun wool yarn, vegetal-dyed pale yellow and dark blue (indigo), Z-spin; 1-ply raveled commerical wool yarn, synthetic-dyed scarlet, Z-spin; 4-ply commercial wool yarn, synthetic-dyed yellow green and pale green faded to blue, Z-spin, S-twist. Selvage = end selvages are 2-ply raveled wool yarn, syntethic-dyed crimson, Z-spin, S-twist. Edge selvages are 3-ply commercial wool yarn, synthetic-dyed red, S-spin, Z-twist. Design: Late Classic sarape-style blanket with a red background. The blanket is divided into three main zones by wide, dark blue terraced-edged bands bounded by multicolor, terrace-edged parallelograms. The zones are crossed by half Saltillo-style diamonds.